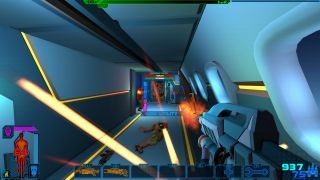 Consortium was an immersive-sim-style sci-fi RPG that plonked you in a spaceship as a sort of future secret agent, giving you free reign over your environment in order to complete your mission objectives. From what I've seen of the game, it reminds me of Sentient, an ambitious adventure which set my imagination racing a million years ago. You can bet I'm intrigued by Consortium sequel The Tower Prophecy, then, which takes the player character, Bishop Six, and literally drops them onto a sci-fi skyscraper. It also updates the engine from Source to Unreal Engine 4, meaning it's looking very pretty as a result. "Building on the strengths of CONSORTIUM, The Tower Prophecy uses all of the core mechanics, interface systems, gear and dynamic fourth wall shattering concepts for an all new scope: The Churchill Tower, a massive, futuristic skyscraper in the heart of London, England. What should have been a straightforward mission to rescue civilian hostages from terrorists turns into a global debacle involving a deeply rooted conspiracy where Bishop Six will be forced to question his allegiances and the morality of meddling across the bounds of existence. There's a new trailer above to whet your appetite for The Tower Prophecy, and I've put a trailer for the first game below.